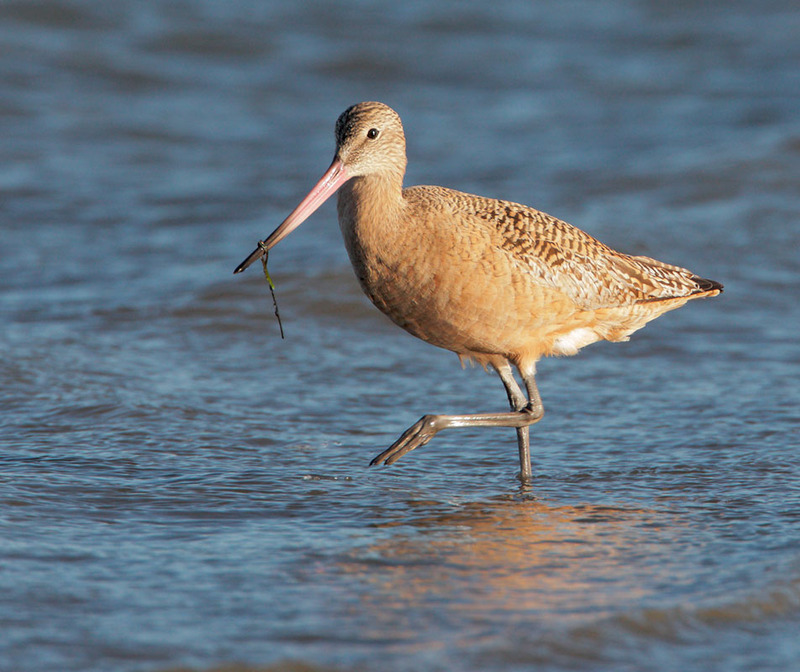 Marbled Godwits nest on the prairies of the Dakotas and central Canada, and large numbers of them winter along the Pacific coast, including the SF Bay Area. 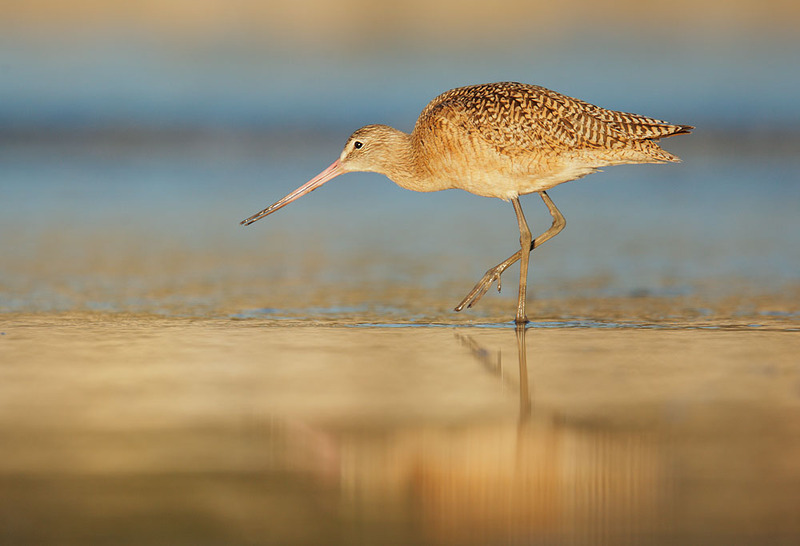 Their cinnamon colors resemble those of the larger Long-billed Curlews, but their bills are shorter and much more nearly straight. Females are larger and have longer bills than males. 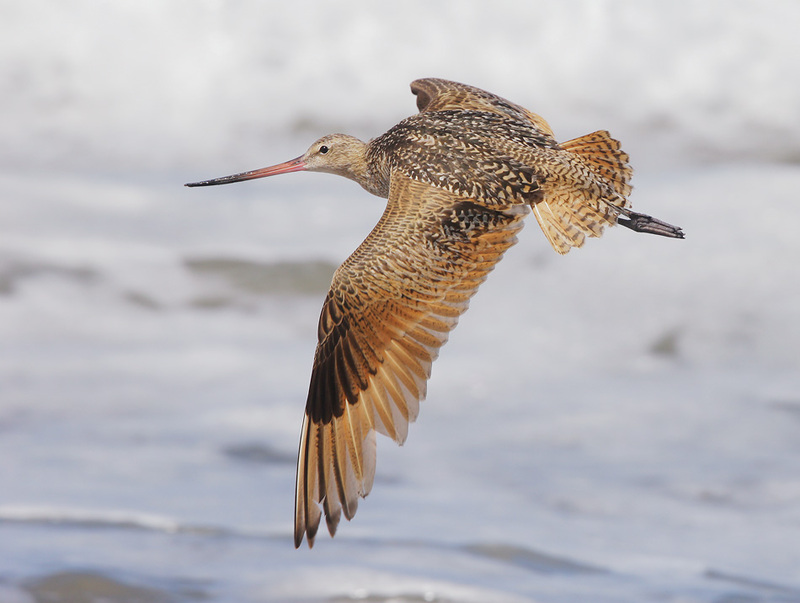 Barring on their underparts emerges or increases in breeding plumage, which otherwise is not much different from non-breeding. 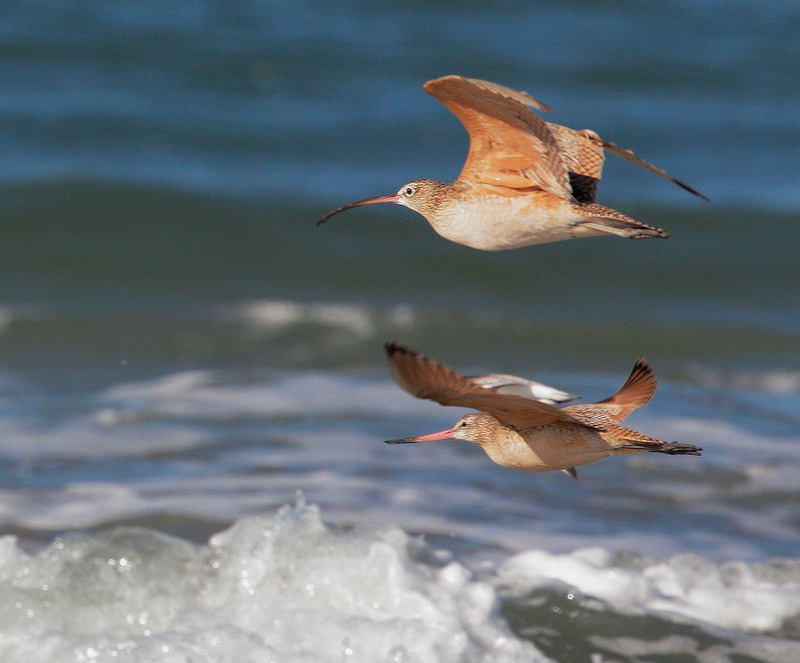 First-cycle birds closely resemble adults, differening in their paler wing coverts and more richly colored underparts, shown in the bird above; compare the adult just below, photographed nearby at the same time. 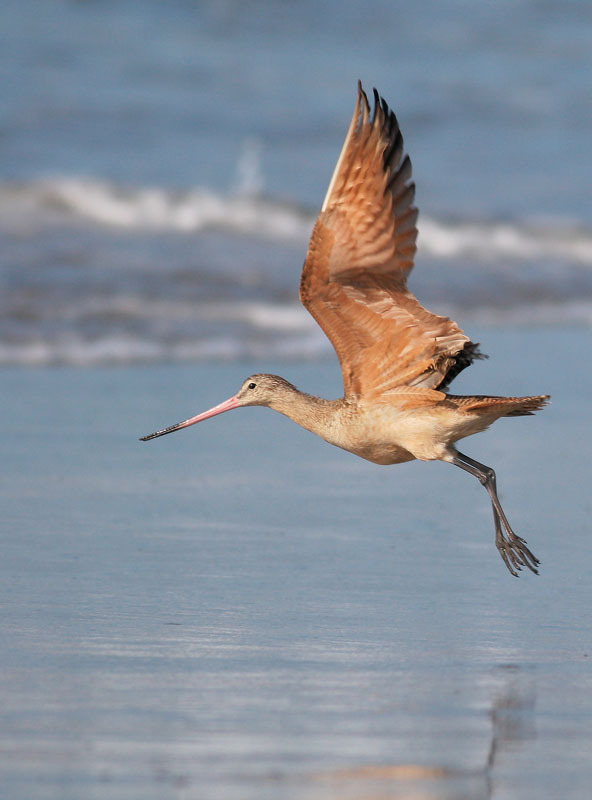 For all ages and plumages, the Marbled Godwit's slightly upcurved bicolored bill, pink on the basal half and dark at the tip, is distinctive. 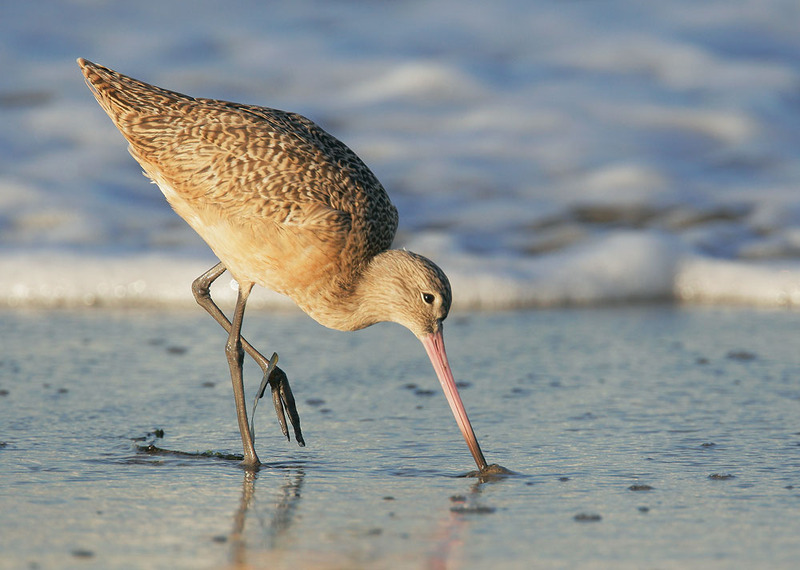 Marbled Godwits allow relatively close approach, and I find them almost irresistibly photogenic, especially when I can get down on my belly and see them at eye level, as in the four photos above, all taken at Moss Landing Harbor. 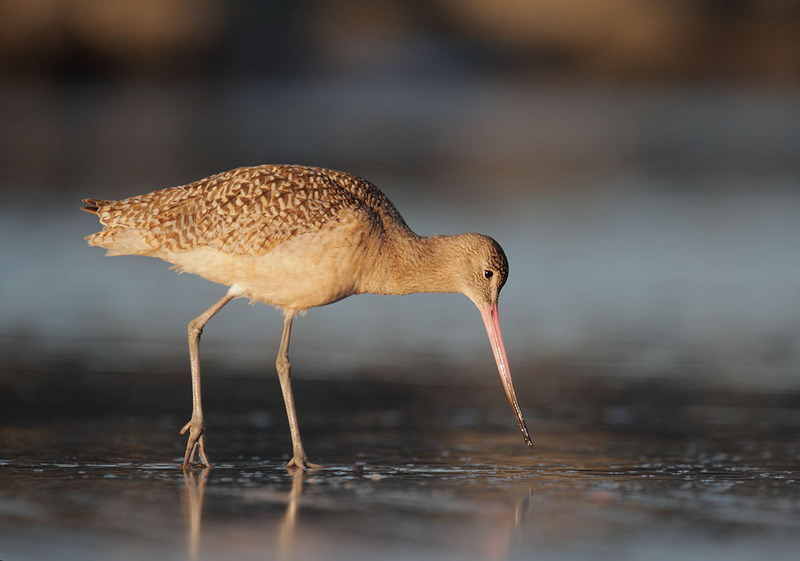 This bird is in pre-basic molt in August, with richer solid-cinnamon underparts replacing barred and paler breeding plumage. 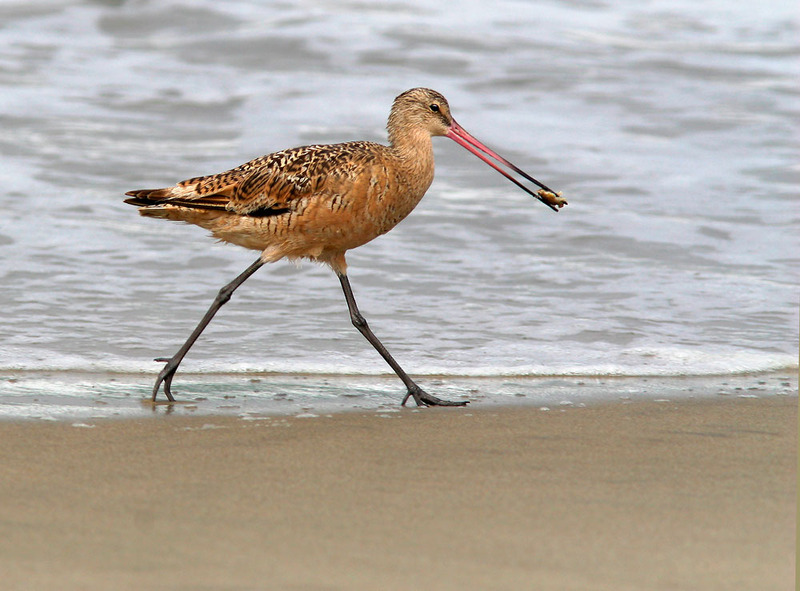 It's carrying a mole crab, a favorite Marbled Godwit prey item. 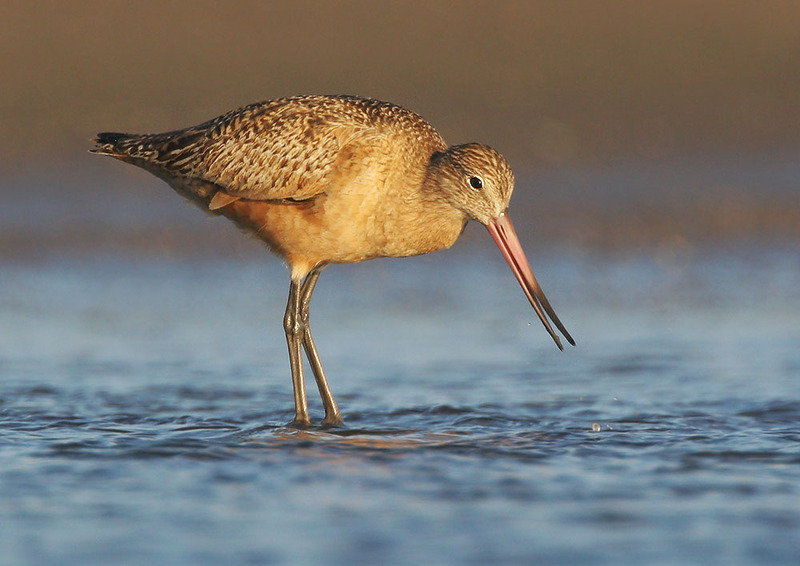 A Marbled Godwit probing for prey in the mud at the surf line. 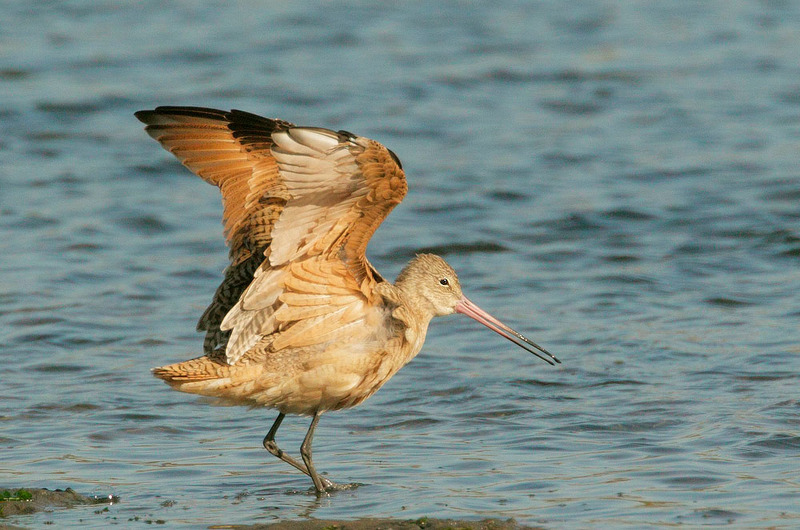 The paler wing coverts and rich underparts mark this as a first-cycle bird. Viewed taking off from the rear, without a view of the bills or any indication of size, is there any way to tell that these are Marbled Godwits and not Long-billed Curlews? 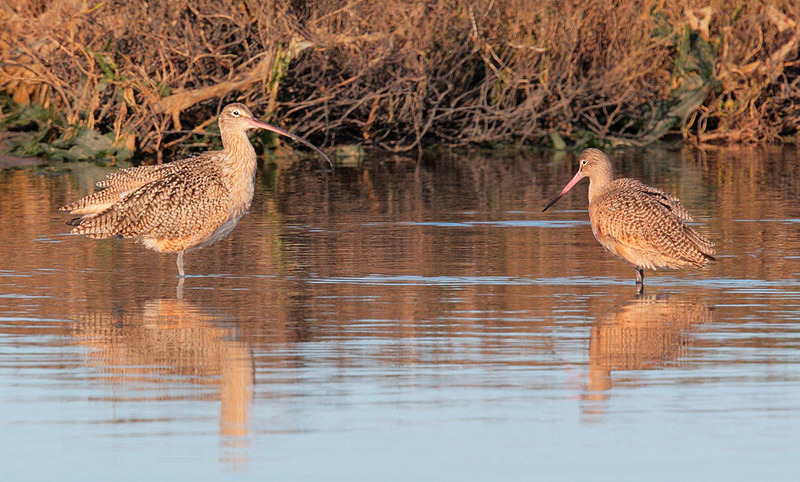 Curlews would have pale gray legs where the godwits' are dark gray or black; for comparison, see here. 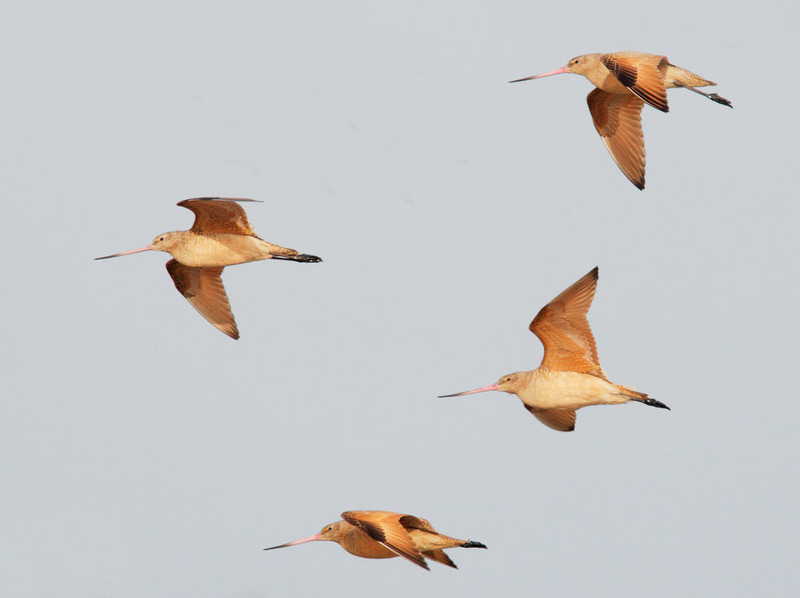 The raised-wing view above shows the variation in cinnamon shades among the Marbled Godwit's feather tracts in fresh Fall plumage, also seen in the flight view below. 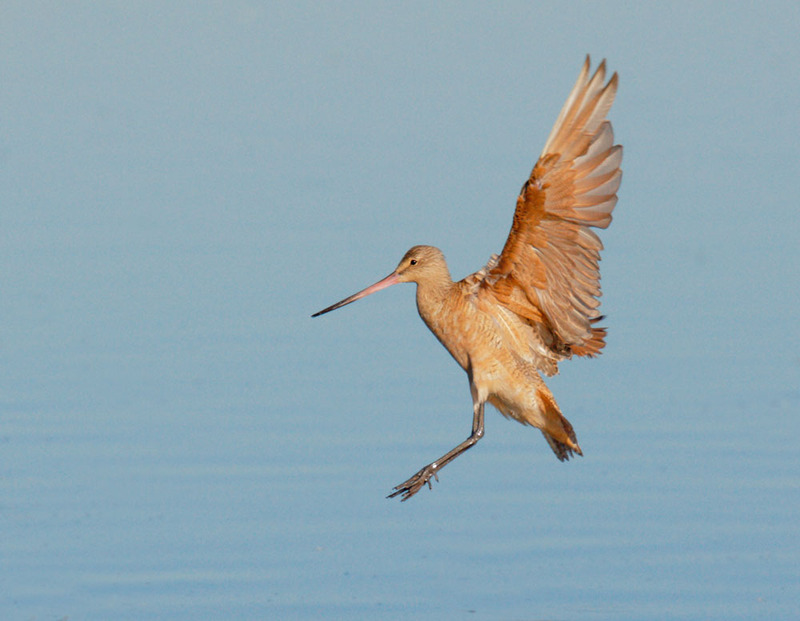 Above, a bird with wings extended in landing position during pre-basic molt in August, with inner primaries replaced, one growing in, and outer ones yet to drop. Below, a bird in the same flight position in February, with a full set of relatively fresh flight feathers. 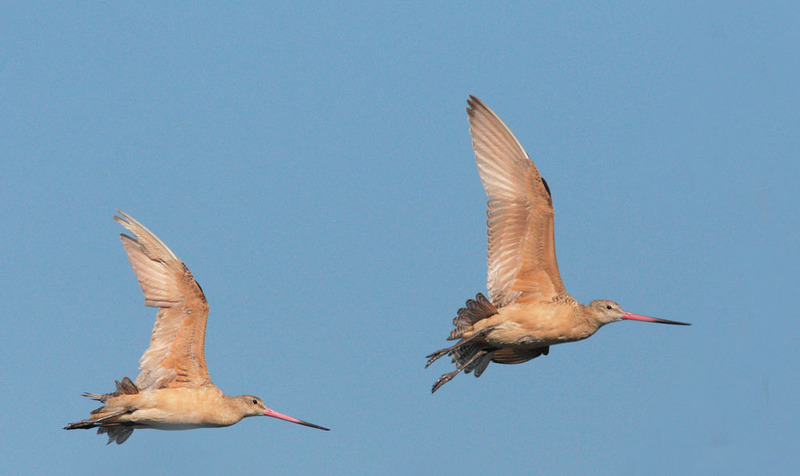 Above, two Marbled Godwits in flight in September, the front one with fresh non-breeding plumage, the rear one still molting. Compare the dark-tipped fresh outer primaries of the front bird with those of the rear bird, tips worn off; both have lost the underpart striping of breeding plumage. 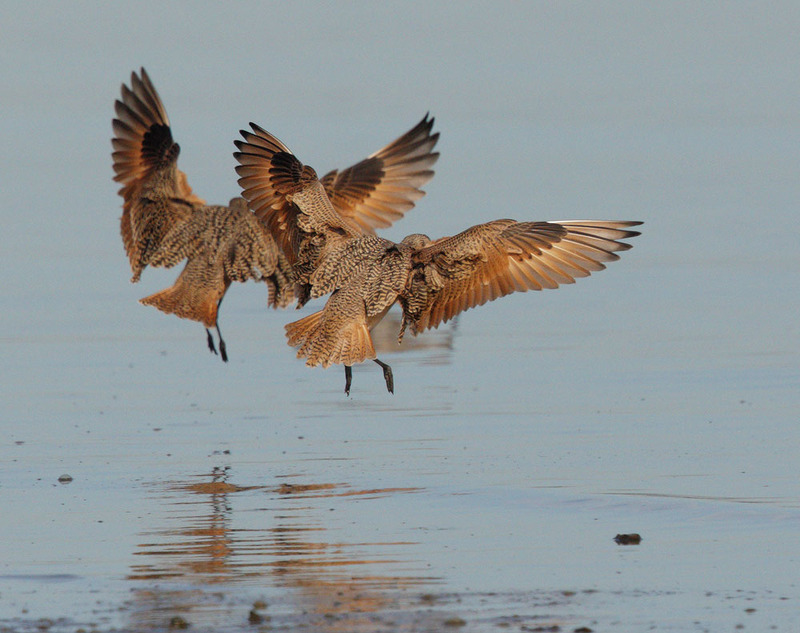 Below, four Marbled Godwits in flight in February, showing full and still relatively fresh non-breeding plumage. 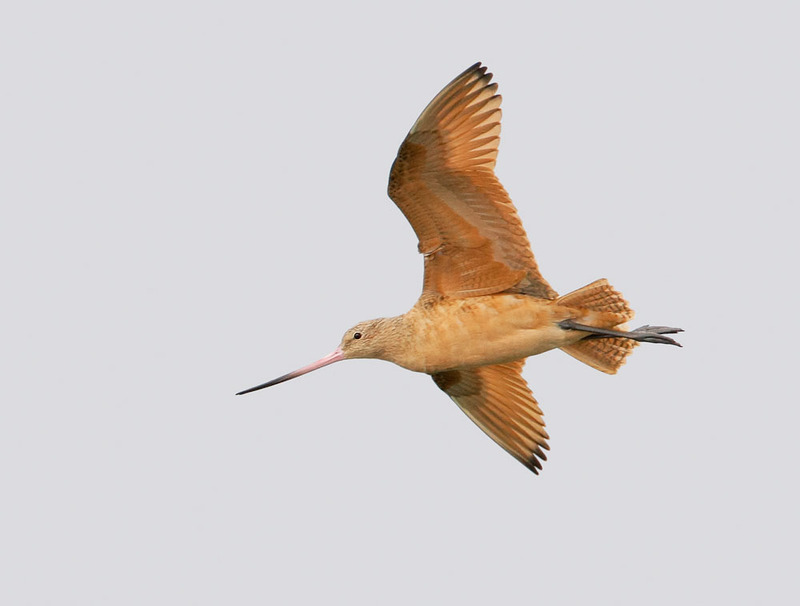 A bird in flight, viewed from above in July, with a primary growing in where the notch appears in the trailing edge of the wing..
A Marbled Godwit (right) with its close relative, a Long-billed Curlew. 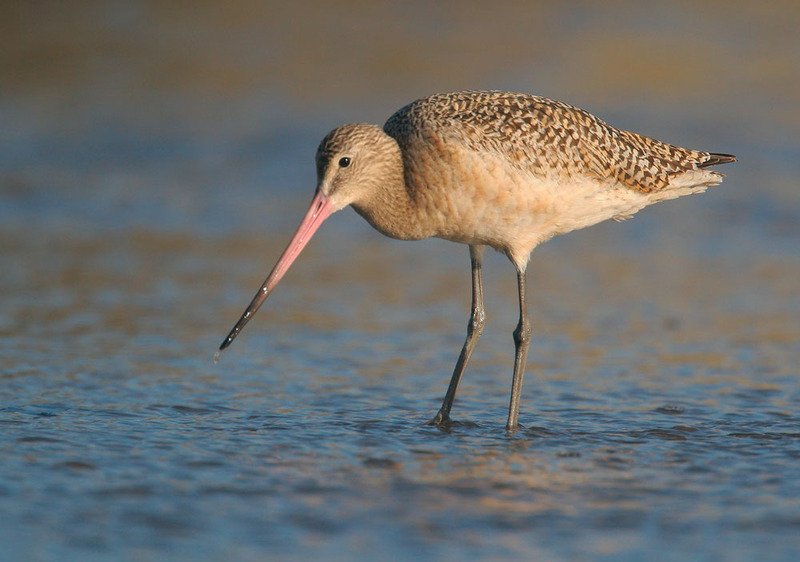 Both have cinnamon plumage and a long pink and black bill; the curlew is larger, with a bill that is down-curved and super-long. 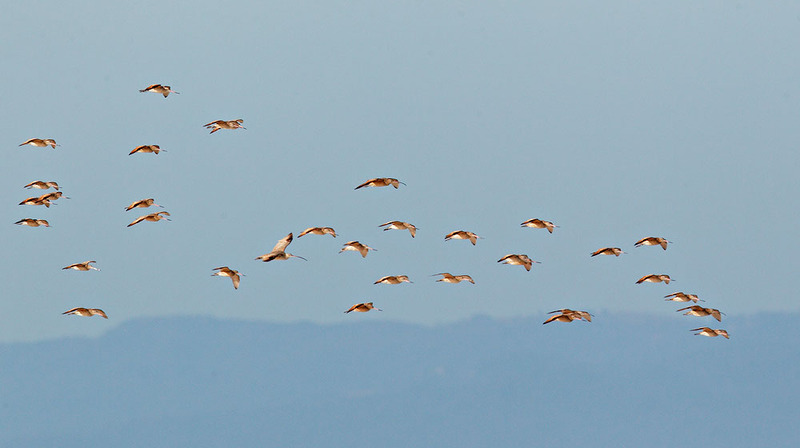 For a view of a mixed flock of the two species seen in the distance on Monterey Bay, with the Santa Cruz Mountains behind, see here; I count 28 godwits and 4 curlews.